Experience the heart and soul of Ayuna in one simple set with Ayuna Minimum. 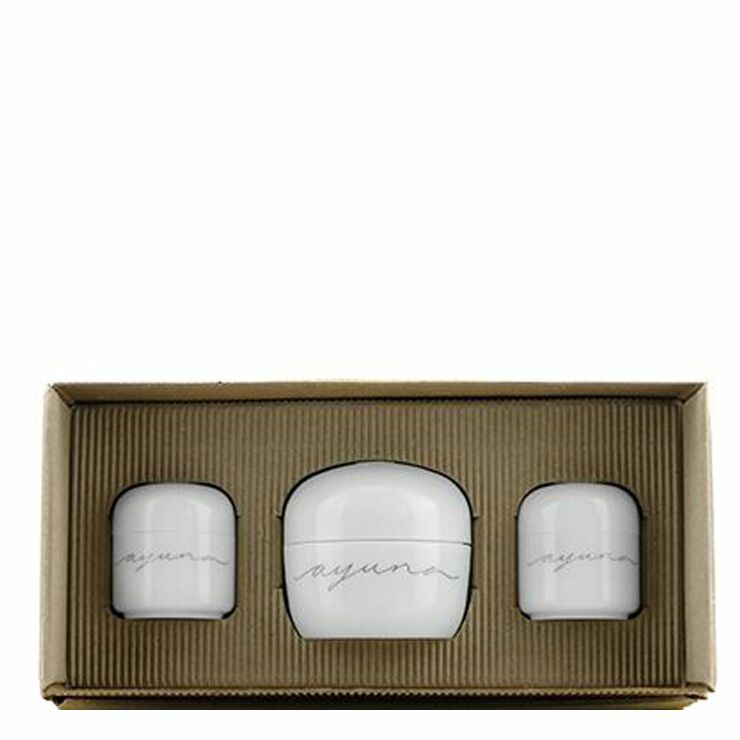 Perfect for gifting, or discovering Ayuna’s beautiful line for the first time, this three-piece minimalist skincare set features daily essentials. CREAM - Citrus Limon (Lemon) Fruit Extract*, Propanediol, Tridecane, Undecane, Aqua (Water) Cetyl Alcohol, Glycerin, Caprylyl Caprylate/Caprate, Alcohol*, Stearyl Heptanoate, Prunus Amygdalus Dulcis (Sweet Almond) Oil*, Butyrospermum Parkil (Shea) Butter, Sodium Stearoyl Glutamate, Lactobacillus Ferment**, Stearyl Caprylate, Gluconolactone, Mircrocrystalline Cellulose, Perlite, Squalane, Maltodextrin, Sodium Levulinate**, Parfum (Fragrance)***, Curcuma Longa (Turmeric) Callus Conditioned Media, Centella Asiatica Callus Conditioned Media, Lactobacillus**, Glycine Soja (Soybean) Oil, Daucus Carota Sativa (Carrot) Root Cell Culture Lysate, Gossypium Herbaceum (Cotton) Callus Culture, Punica Granatum (Pomegranate) Seed Cell Culture Lysate, Sodium Anisate**, Xanthan Gum, Sodium Hydroxide, Cellulose Gum, Cocos Nicifera (Coconut) Fruit Extract**, Tocopherol, Beta-sitosterol, Citric Acid, Squalene, Caramel, Sodium Benzoate*. ESSENCE - Citrus Limon (Lemon) Fruit Water*, Olea Europaea (Olive) Fruit Oil*, Cellulose, Oleyl Erucate, Glutamic Acid, Propanediol, Behenyl Alcohol, Glyceryl Stearate Aqua (Water), Aspartic Acid, Lactobacillus Ferment**, Sodium Hydroxide, Sodium Stearoyl Glutamate, Gluconolactone, Squalane, Glycerin, Lactobacillus**, Sodium Levulinate, Glycine Soja (Soybean) Oil, Parfum (Fragrance)***, Sodium Anistate**, Xanthan Gum, Citric Acid, Cocos Nucifera (Coconut) Fruit Extract**, Tocopherol, Bete-sitosterol, Squalene. BALM - Citrus Limon (Lemon) Fruit Water*, Pullulan, Olea Europaea (Olive) Fruit Oil*, Alcohol*, Charcoal Powder, Squalane, Microcrystalline Cellulose, Aqua (Water), Sodium Stearoyl Glutamate, Lactobacillus Ferment**, Gluconolactone, Glycerin, Perlite, Lactobacillus**, Cellulose Gum, Sodium Levulinate**, Glycine Soja (Soybean) Oil, Ceratonia Siliqua (Carob) Gum, Parfum (Fragrance)***, Sodium Hydroxide, Sodium Anisate**, Citric Acid, Cocos Nucifera (Coconut) Fruit Extract**, Tocopherol, Beta-sitosterol, Squalene. CREAM - Carrot Root, Coconut, Pomegranate, Squalane, Sweet Almond Oil, Turmeric.